So, now you have invested a lot of time and money scanning in those precious photographs, digitizing sound recordings and old videos. You have had grandma Jones tell the story of some old photos into your microphone, and you’ve attached those digitized sound bites to the scanned photos. 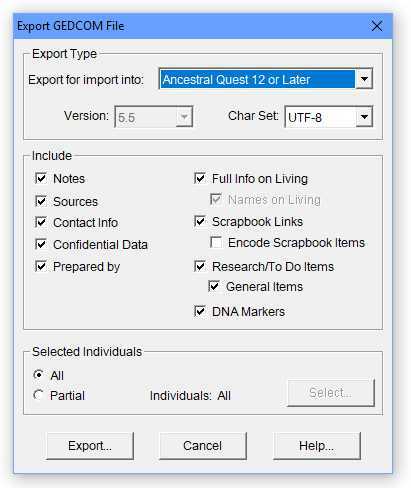 Whether you use Ancestral Quest™ (AQ), or Personal Ancestral File® (PAF), you have the tools to assemble this type of multimedia scrapbook. If you’ve used these tools, you know how wonderful it is to have this legacy, but there’s only one problem. How do you share it? Make a GEDCOM file of your data and send this to your relative. Make a backup of all your digitized photos and other scrapbook items. Work closely with your relative on restoring that backup. Work closely with your relative on linking those scrapbook items to the individuals in your database. Now, ever since the release of AQ 3.0.30, you can send your full family history — choreographed slide shows, interactive scrapbooks, and all — to your relative in one simple step through the Export tool. Notice the GEDCOM Export screen. As always, you want to select the individuals you will export — choose ‘All’ or ‘Partial’. If Partial, click the Select button to select just those branches and leaves of your family tree that you want to share. Then make sure that you have selected both the Scrapbook Links checkbox and the Encode Scrapbook Items checkbox. As AQ goes through the normal process of creating a GEDCOM file, it will actually take the digitized files that are linked to the selected individuals and make a copy of them within the GEDCOM file. Depending on how many files you have, and how large those files are, you can expect your GEDCOM file to be many times larger and take a bit longer to create than what you have experienced in the past. After the GEDCOM file is made, you will want to ‘zip’ it up before trying to send it to your relative. While this is normally true, it is more urgent when you have embedded the digitized scrapbook items in it. This article assumes you are comfortable with zipping up a file. If not, you may want to ask a friend for some help with this. Finally, if you are the recipient of a GEDCOM file with embedded scrapbook items, here are some things you should keep in mind. If you are using an up-to-date genealogy program that can handle multimedia objects in a GEDCOM file (at this writing, AQ 3.0.30 and later is the only software program we know of that can handle this), you will be given an option to ignore these files or to have them created on your disk. (See the figures above — notice the Import Scrapbook Items option.) 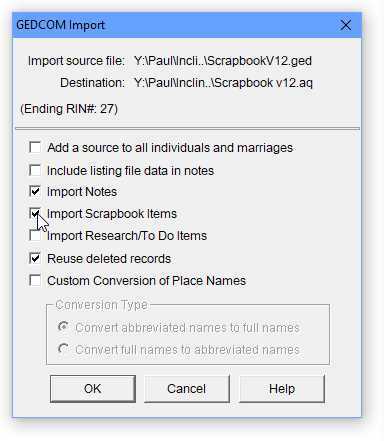 To extract the media files from the GEDCOM file, be sure to select the Import Scrapbook Items option. If you are using a program that does not expect these scrapbook files, you may get very interesting results, or these files might just be ignored, depending on how well the GEDCOM import feature of that program is written. When AQ attempts to write a media file back out from the GEDCOM file, it will use the same file name and folder name as on the machine where it originated. It will try to write to the same drive letter (i.e. ‘C:’ or ‘D:’) as where it originated, but if that drive letter is not a writable drive on your machine, it will use the drive where the database you are importing to is located. For example, if the sender had his data on a second hard drive, which was labeled ‘D:’, but on your machine the ‘D:’ drive is a CD-ROM drive, then these files will be written to your ‘C:’ drive, where your data files are kept. But if you also have a second hard drive, then the files will be written to your ‘D:’ drive. You will be prompted to create the missing directories. Click OK.
Once the import has been completed, the scrapbook items should appear throughout the database, just as in the original.